"How are the new breeds getting along with my dogs?" 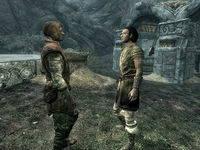 Banning is a Breton ranger who lives with Cedran at the Markarth Stables selling war dogs. A dog named Vigilance can be bought from him for 500 gold. You can make a delivery to Voada on his behalf. He is also one of the guests of The Taste of Death. He wears farm clothes with hide boots. He also carries around an iron dagger, some small change, and the key to the Markarth Stables. He wakes up at 6am to have breakfast. At 8am, he heads outside to tend to his dogs outside for a long twelve hours, skipping dinner due to an oversight (see bugs). He can be found inside the stables at any other time, going to bed at midnight. Banning also knows the spell Conjure Familiar. He'll greet you by advertizing his dogs: "Need a trained war dog? Fiercest companion money can buy. ", "A war dog is good company and good protection. ", "I like the loyalty of a dog. Not as fickle as a wolf. ", and "You have to train a good war dog from a pup. Bite your arm clean off otherwise." If Cedran has come to pass, Banning will take over the stables and gain the ability to sell you a horse: "I'll be handling the horses with Cedran gone. Miss that old man." If Banning is the one having met his end, Cedran may instead greet you with: "Poor Banning. Twice as much work here in the stables without him." 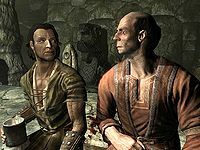 You can ask him to tell you what he knows about Markarth, granting you the short answer: "Don't fall." When you successfully buy a dog from him, he'll add: "Good. Here you are. He'll follow you to Oblivion and back, if it comes to that." When you try to buy one when you've already got a pet follower, he'll refuse your purchase: "Sorry. You already have an animal with you. ", similar to when you don't have enough gold: "War dogs cost gold, friend. Come back when you have some." Cedran: "Think we should buy more horses next season?" Banning: "I'd rather spend the gold on a new litter of pups, but the horses bring in more gold." Banning: "How are the new breeds getting along with my dogs?" Cedran: "Haven't attacked each other yet. Good a sign as any." If you aren't on another delivery, you can ask him how long he's been training dogs, to which he'll admit: "My family has been doing it for years. You need one out in the Reach. Don't want to be alone when some Forsworn comes swinging. I personally trained a whole litter for the Jarl. That reminds me, I was going to deliver some dog food to the Keep. Spiced beef. Their favorite." If you tell him you could deliver that for him, he'll be grateful: "Well, look at you, thanks. Take it to Voada, she handles all the dogs for the Jarl." You can also bluntly remark "That's a shame. ", granting you a: "Yeah, yeah." During The Taste of Death's feast, Banning is found sitting at the dinner table. If you talk to him, he'll greet you with: "I remember my first feast. I envy you." When you remark "Wait, I know you. ", he'll hint that the secret of the ferocity of his hounds lies in the choice of meats given to them: "You buy a war dog from me? There's a reason why my hounds are so eager to bite into people." If you've delivered his spiced beef before, he'll recognize you as well: "Ah, yes. The courier. I guess you know my secret ingredient for that spiced beef, now." If you've completed the feast successfully, he may be found greeting you subsequently with: "You were given Namira's ring? A great honor." "When was your first meal, Banning?" Eola: "Not too full on bread and wine, I hope?" Banning: "I always leave room for the main course, Eola." Hogni: "When was your first meal, Banning?" Hogni: "Of course they don't count!" Banning: "My friend Marex. We were hunting, and I thought he was an elk." Hogni: "That must have been quite a surprise." Banning: "Either way, I came back with meat for the table." Lisbet: "It's so good to have everyone around the table again." Banning: "Eola is a fine host. She really keeps the faithful together." Lisbet: "I'm just glad we had this, now. I was almost getting ready to eat my servant and blame it on the Forsworn." 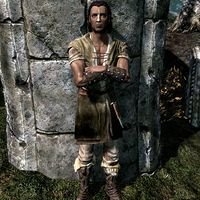 After the quest, you can ask him if he was at Namira's feast and he will respond: "Better if we don't talk about that. As far as anyone's concerned, we all had dinner at a nice inn along the road, and nothing strange happened." Banning was supposed to have dinner from 6pm to 7pm, but his work package overrides this. This page was last modified on 17 December 2017, at 19:15.